Samoas, also known as Caramel de-Lites, have always been my favorite girl scout cookie (although I do enjoy Do-Si-Dos, Tagalongs and Thin Mints). I’m not sure how they rank in the overall scheme of GS cookie popularity, but I will go so far as to say that I have never met someone who didn’t care for them at all – even people who say that they usually don’t like coconut. I think that the cookie is just a good and rather unique combination of flavors. 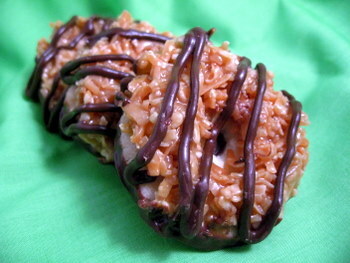 The Girl Scout bakeries describe Samoas as vanilla cookies dipped in caramel, topped with coconut and drizzled with chocolate. All good flavors, though I have to admit that I never tasted much vanilla in the cookies themselves, and so I used this description as a jumping off point for my version. I remember the cookies as being crisp and tender in the original, and selected a plain shortbread-like base for these. The cookie dough is very rich – by which I mean that it has a lot of butter – and is very easy to work with. The butter keeps it tender, so it won’t toughen up even after repeated rollings of the dough. For the topping, I debated between using a from-scratch recipe like Chockylit‘s or a semi-homemade recipe like Debbie‘s. The from-scratch recipe sounded appealing, but I opted for the semi-homemade version because I had a ton of Werther’s Chewy Caramels around already. These particular caramels are nice because they’re made with real butter, sugar and cream (rather than using partially hydrogenated oils, as a number of other caramels do). Of course, you can use any similar chewy caramel that’s handy, I just recommend picking out one with the best ingredient list you can find. Different types of caramel will be sticker/harder than others, so be patient as you work with it. I did take Chockylit’s suggestion of toasting the coconut for bit of extra texture. I used dark chocolate for the dip and drizzle, and set each of the cookies on a piece of parchment paper after dunking them in the chocolate to let it set up in an even layer. There are two ways to get the shape for these cookies. The first is to roll the dough out between pieces of wax paper and use a cookie cutter to make rounds, cutting the smaller center hole later. This technique works great and doesn’t take too long, especially as the dough can be rerolled a couple of times. The second technique calls for a special pan: a mini donut pan. If you have a pan like this, simply press some cookie dough into the tube and bake. The dough doesn’t rise much, giving you a nice flat side and a perfectly rounded one. Take your pick and go with what is convenient for you. And since you’re all probably wondering, these cookies were absolutely fabulous. The cookies were tender and buttery, the topping was sweet with a delicious coconut flavor, and the dip of chocolate on the bottom of each cookie balanced all the flavors perfectly. Better than I even remember the Girl Scout cookies being. I could – but I won’t – probably eat an entire batch of these on my own. Note: These cookies are fairly time consuming to make, but if you take your time and have fun with them, the results will be worth it.Â That said, if you want something a little bit quicker, try baking a batch of Samoas Bars instead, which require no rolling and cutting of the dough! I do not own a microwave. Can you offer any tips for improvising the caramel part? Can I place this over the stove? Katrina, you can try sauteeing them lightly in a pan. That’s what I intend to do for the toasted coconut (I find it browns it much more evenly than in the oven) and the chocolate (I had a miserable experience with burnt chocolate in the microwave once). I think this recipe SOUNDS great! I don’t have a candy thermometer which most of the other Samoa recipes required but they’re my boyfriend’s favorite so I told him I’d make him a batch. I’ll post another comment when I’m done, let you know how they are! Yummy! Just made these, about 60 (could’ve made more but got sick of cutting them out). Used one bag of coconut (~7 oz) and one bag of werthers chewable caramels (~5.5 oz). Added a LOT more milk to the caramels – probably around 1/4 cup – which made it more gooey and less firm (I saw some people had issues with the caramel being too hard). Added milk to the chocolate as well since I was running low. The cookies themselves I found to be a bit too buttery to my liking, but other than that they were absolutely delicious. Note: Poster wasn’t kidding when she said that these cookies take a long time!!! This recipe is FABULOUS! The cookies are SO delicious and the coconut caramel/chocolate combo would be yummy on SO MANY other things! Thank you for the fantastic recipe! ps. you weren’t kidding about them being time consuming! Those look so good! I think I can get in trouble with these!! I cant wait to try these!!!! I am making these tonight for the 5th time and I am confident they will win my Holiday Baking challenge at work tomorrow! Worth every second spent on making them! Having volunteered at a Cookie Drop, I can say with authority that the Thin Mints are the most popular, but Carmel de Lites/Samoa’s are the 2nd most popular. This is recipe is flawless. I baked a batch and froze half. Before the week was out all of them were gone (frozen half too)!! Just made these, and I’m not sold on the shortbread recipe. I had to add almost 1/4 cup of milk to get a dough, and at 1/4 inch raw, they puffed up and we’re not crispy like I’d hoped they’d be. I might have messed up somewhere, but I don’t think so. Other than that, the carmel coconut topping was perfect, and they look remarkable. Next time, though, I’ll probably use the cook’s illustrated shortbread recipe. thanks for the ideas, though! Is whole milk used in this recipe? or skim? i just finished making these and they are delicious! These cookies were definitely time consuming, it took me four and a half hours! Any diet I had going for me is suddenly gone. 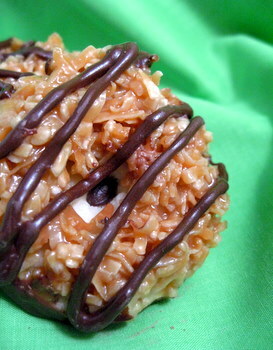 I cannot resist a Samoa any day of the week! Yay for movie night treats! Thanks for the recipe! Homemade Girl Scout Cookies | SugarHero!